The Coalition for the Woolworth Building will rally behind this banner at the MLK March in support of the civil rights legacy of the Woolworth Building. Please join us! 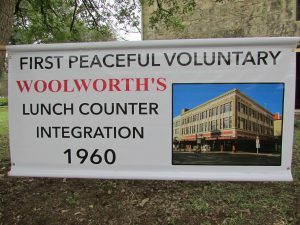 The Woolworth Building on Alamo Plaza represents a unique site in the civil rights movement in San Antonio, and across the United States, for its role in lunch counter integration. However, the recently approved plan for Alamo Plaza keeps the option open for Woolworth’s demolition. If you would like to march with us, please RSVP on the Esperanza Peace & Justice Center’s Facebook. We will gather at 9:30 a.m. at 3501 MLK Drive (MLK Middle School/Academy). Meet us at the driveway entrance to the school parking lot, on the side nearest the Boys and Girls Club and MLK Park. Keep an eye out for our Woolworth Building banner. Please be sure to give yourself plenty of time to find parking and join us at the meet up location – it will be crowded! Free VIA bus service is also an option. 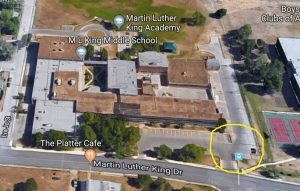 The March route is 2.75 miles and starts at the Martin Luther King, Jr. Academy (3501 Martin Luther King Dr.), travels up Martin Luther King Drive, and ends at Pittman Sullivan Park (1101 Iowa Street). We will have an information booth about the Woolworth Building at the end of the March. Please stop by and say hi! The Coalition for the Woolworth Building is a grassroots advocacy group. We support the preservation of the Woolworth Building and want to build on its presence in Alamo Plaza to share an integrated history that includes African-Americans. Members include: San Antonio African American Community Archive & Museum; Esperanza Peace & Justice Center; Westside Preservation Alliance; concerned historians, civic leaders, and community members; and the San Antonio Conservation Society.